Even though I lived in Tempe, I never went to Big Surf, so I thought that it would be fun to do some imaginary surfing today. Personally, I've never surfed. I've also never skateboarded, or have done anything that requires the kind of excellent balance that that type of activity shows off. I could ride a bicycle, but that's about it. But this is an imaginary story, and here I'm surfing, and you're shouting "Cowabunga!" Big Surf Waterpark is at 1500 McClintock Drive, which is north of the river between Curry and McKellips. 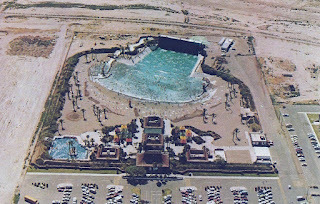 And I have to admit that when I lived in Tempe, going to ASU, I really didn't realize that Tempe didn't stop at the river. Tempe actually ends at McKellips, although it wiggles around a bit behind the zoo. Since it's the 70s, I'm not using sunscreen. Instead I've made sure to get a dark "base tan" so I won't burn. Whether people knew about the dangers of cancer from the sun back then I have no idea, but I sure wouldn't have known. I have some zinc oxide on my nose, which looks like goofy, but that's it. In this imaginary story I'm not only an excellent surfer, I work as a lifeguard, so I have plenty of zinc on my nose just about all of the time. You get used to it. 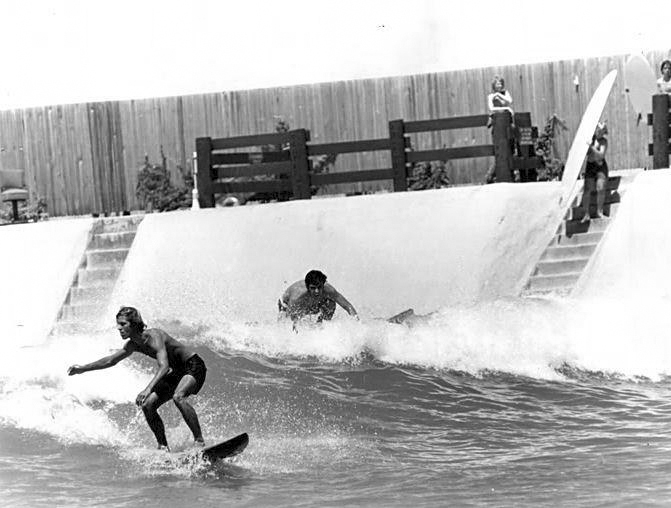 Big Surf in the 1970s, Tempe, Arizona. I'm no longer all that young, I'm 26, but I can still surf better than anyone else at Big Surf. 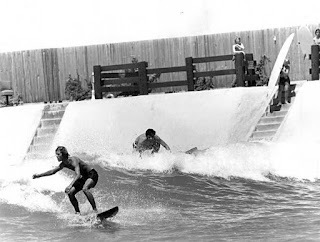 In the summers I visit my friends in California, and we usually surf at Redondo Beach, or the Ventura county line. In California I usually wear a wetsuit, but there's no need for it in Arizona. It must be 110 today, at least 100! Feels good. I can hear the Beach Boys singing, "Tell the teacher we're surfin', surfin' Arizon-IAY!"